HAMPTON, Ga. — John Hunter Nemechek’s roller-coaster Saturday at Atlanta Motor Speedway started out “sketchy,” but ultimately ended with a solid top-five finish in his NASCAR XFINITY Series debut. Driving Chip Ganassi Racing’s No. 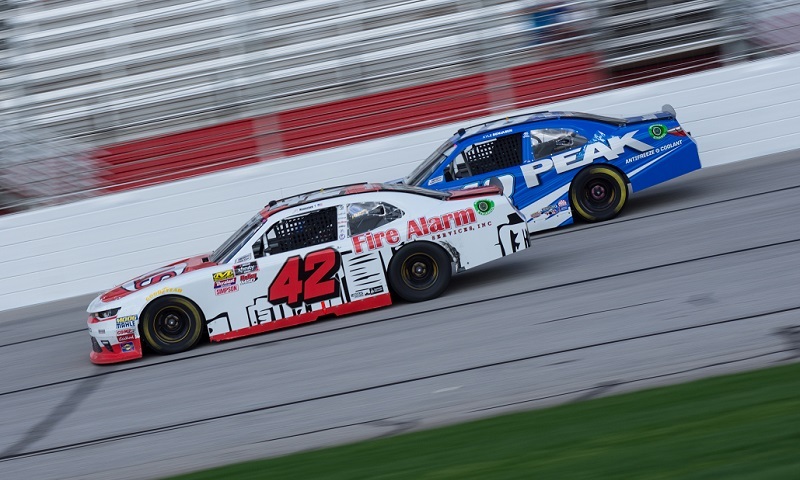 42 Chevrolet for the first time, Nemechek rallied back from a myriad of obstacles in the Rinnai 250, including a near-spin on lap six, contact with Cole Custer that drew the first caution of the day on lap 11 and a flat tire just before the end of the first stage. At that point, he found himself one lap down to the leaders, but quickly caught the lucky dog at the end of the first stage to get back on the lead lap. From then forward, it was game on as Nemechek clawed his way through the field from as low as 30th. In the end, Nemechek passed 26 cars to come home fourth at the checkered flag, a solid effort in his maiden voyage for team owner Chip Ganassi and his best NASCAR result in any of the top three series since a runner-up finish in the NASCAR Camping World Truck Series race at Arizona’s ISM Raceway in November. Nemechek was particularly apologetic to Custer, however, after his involvement in the lap 11 crash that took his fellow NASCAR Next alumnus out of the race.